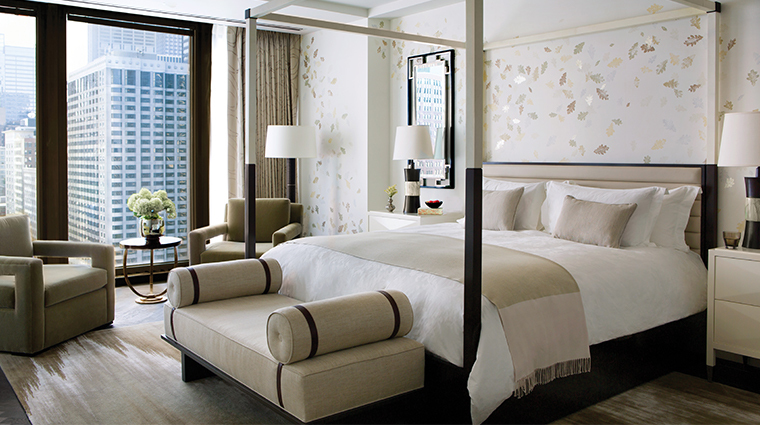 The Langham, Chicago occupies the first 12 floors of a landmark building that sits beside the Chicago River. 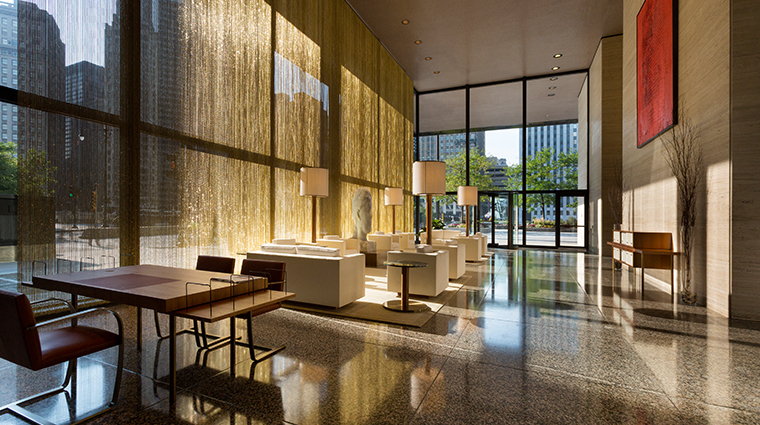 Designed by Midcentury Modern master architect Mies van der Rohe, the soaring 52-story structure was added to the National Register of Historic Places in 2010. Inside the hotel, you can see nods to the building’s heritage — large, elegant guest rooms have subtle bronze accents while gorgeous travertine tiles are found in bathrooms and in public spaces. The Langham, Chicago is the luxury hospitality company’s fourth property in the United States and although the brand is new to the Windy City, the hotel reflects the centuries-old heritage and European hospitality sensibilities of the original 1865 Langham in London. Guests are able to take afternoon tea in the open and airy Pavilion, dine on seasonal American fare at Travelle (designed by David Rockwell), indulge in a treatment at the Asian-inspired Chuan Spa or retreat to the 12th-floor club lounge for cocktails and magnificent views of the Chicago River and Lake Michigan. A true oasis for business travelers, the 12th-floor lounge has butler service, offers incredible views of the city skyline and serves complimentary light bites and cocktails all day long. 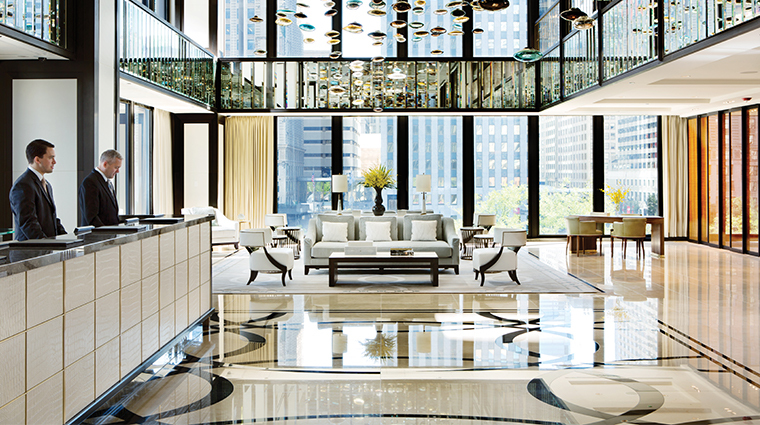 Chuan Spa at The Langham, Chicago has seven treatment rooms, a manicure/pedicure room, and a lounge with heated stone loungers to relax in pre- or post-treatment. 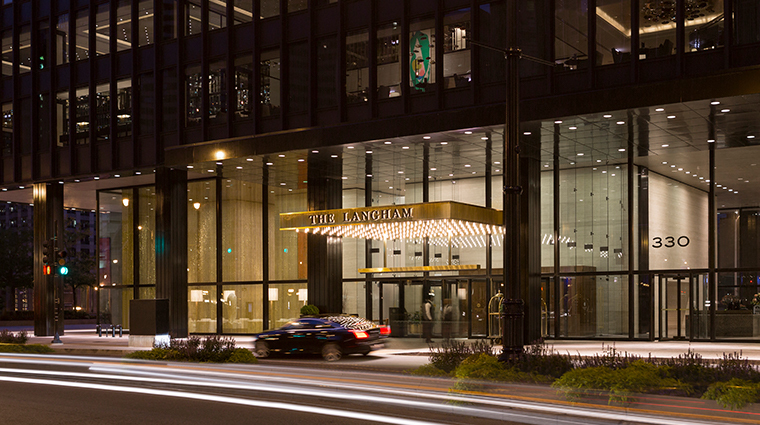 Perhaps the most striking aspect of The Langham, Chicago is the building it is housed in, a Ludwig Mies van der Rohe-designed riverfront landmark. The Midcentury Modern building was added to the National Register of Historic Places in 2010. With a riverfront location in downtown Chicago, the hotel is mere minutes from the Loop, Grant Park, Magnificent Mile, Millennium Park, and Navy Pier. The gorgeous 67-foot indoor pool offers the perfect place for a dip accompanied by a hydrotherapy hot tub and luxurious locker rooms featuring heated loungers, Himalayan salt saunas and steam rooms. The very best views are found in the southeast corner rooms, with wide vistas of the river, the lake and the Loop. The Langham claims to be the first grand hotel to offer afternoon tea service at its London flagship in 1865 and continues the tradition at each of its locations. Be sure to dine at Travelle if only for the décor. The restaurant features a glass-enclosed show kitchen, two wine walls that hold 300 bottles each, and a massive digital art installation that can be seen from the street below. Guest rooms start at just over 500 square feet, and feature floor-to-ceiling windows, separate dressing space (with a vanity table), 55-inch LCD televisions, and bathrooms clad in marble, granite and travertine. Rooms have one of two color schemes — cream and aubergine or cream and olive, while each has a writing desk and chair, a large closet and a mini-bar that rivals any we’ve seen. The design nods to the Mies van der Rohe building’s Midcentury Modern architecture while maintaining a thoroughly contemporary look. Subtle bronze details are seen throughout the space, framing the mirrors and lining the upholstered headboards. Located on the second floor of the luxury hotel, Travelle serves up seasonal American fare in an industrial-chic David Rockwell-designed dining room. From a glass-encased open kitchen, chef de cuisine Jeff Vucko and his team churn out flavorful plates like barley risotto with butternut squash, diver scallops with golden tomato beurre blanc, and a selection of prime cuts. Tucked in a corner, you'll find Travelle's window-framed bar, the perfect spot for an art-inspired signature cocktail (try Midori Garden for a fragrant blend of gin, matcha, lavender and banana). Or take your tipple into the adjoining lounge to sip while gazing out at panoramic skyline views. Pavilion, on the other hand, is filled with light and has a warm, elegant feel with sofas, plush chairs and a fireplace. The bright and airy Pavilion serves light fare throughout the day, including breakfast, and works well as a comfortable, welcoming spot to relax. You can also order the hotel’s famous afternoon tea here.